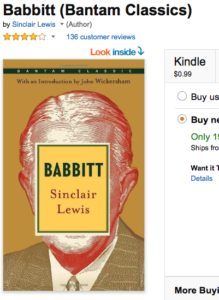 My memory is not what it used to be and never was that good, so, when a FB friend asked if I have read Babbitt by Sinclair Lewis, I didn’t have a quick answer. On his recommendation, I downloaded it to Kindle and plowed through. My first impression was that this is a great read for anyone going through the examination of conscience process in preparation for confession. The common though sometimes unrecognized sins committed by George Babbitt as he progresses from self-centered, self-righteous, successful businessman with questionable ethics through a period of wavering reflection, drunkenness, adultery, and rejection by the establishment, and back to where he began provides a good checklist for comparison with our own behaviors. I quickly lost count of the number of sin-remorse-resolve-relapse cycles experienced by rationalization champion Babbitt. At the South Carolina Book Festival a few weekends ago, one writer/speaker on a discussion panel mentioned the importance of having at least one likable character in any work of fiction. In Babbitt, I found neither the protagonist nor anybody else in that category and was tempted to lay it aside about a third of the way through. I did, however, find myself curious about how the writer was going to resolve the mess created, and it was only that curiosity that kept me going. Unfortunately, there was no redemption for Mr. Babbitt, his only hope being that his son would chart a different path. On the last page of the book, Babbitt offers his son the honest confession that he has “never done a single thing I’ve wanted to do in my whole life! I don’t know’s (sic) I’ve accomplished anything except just get along.” Then he warns his son of the pressures and bullying he will face and tells him to do his own thing. And the book mercifully ends before Babbitt has a chance for his next fall. “Bullying,” by the way, is a theme of the book. A quick search on the Kindle revealed 17 instances of use of various forms of the verb. It is interesting that it is such a hot topic now, almost a hundred years later. The most dislike-able thing about Mr. Babbitt is his insistence on categorizing, labeling, and demonizing anybody different, not in his own group or category, that insistence exceeded only by author Lewis’s insistence on categorizing and labeling and demonizing the business establishment in general. The book seems to be an incentive to class warfare, designed to stir up hate and resentment. We can be discouraged because we know that, in the real world, every Babbitt launching demonizing attacks on the poor or minorities or immigrants is balanced by somebody demonizing the more successful. And the class war is on. Our only encouragement comes from knowing that the categories are unfair and that there are both saints and sinners in all such groups. It is individuals and not groups or categories who bear responsibility for sins. The book seems timeless because the categorizing, labeling, and demonizing continues today with a vengeance, greatly accelerated by the 24-hour news cycle and social media. The current popularity of categorizations such as “red state” or “blue state,” frequent misuse of the suffix phobic, organized resistance to silence speakers on college campuses, boycott of businesses that don’t toe some currently popular line, and widespread use of the labels “haters” and “deniers” are some of the most obvious examples. It is often easier to create enemies than to make friends. LORD have mercy, and help us love our created enemies as well as the real ones. By the way, I am now certain I had not read the book earlier, nor will I read it again. It is too disturbing, with not a likable character in sight.